A helpful way to reduce the length of a divorce proceeding is for the parties to agree on and stipulate to some of the significant issues to be resolved. Such a stipulation may address matters such as property division, spousal support, and child support, among many other items. While it is not always possible for the separating spouses to reach an agreement on all major issues, the ability to enter into a stipulated divorce judgment will likely result in a more acceptable and less costly process. To help ensure that you are doing everything in your power to reach a mutually satisfactory agreement, you are encouraged to consult with an experienced family law attorney from the local San Diego area. It is extremely important for the spouses to be forthcoming and honest about the issues addressed by any stipulation. Engaging in dishonest behavior or fraud during the divorce proceedings may serve to invalidate your stipulated judgment and all that it contains. In a recent California divorce case, the ex-wife brought an action to vacate the stipulated divorce judgment — eight years after it was entered by the court. According to the facts, the couple got married in 1974 and separated in 2004. At that time, their two children were adults. In August 2005, the parties reached a settlement, resulting in a formal stipulated judgment that determined the division of property, among other things. The ex-husband was unemployed at the time of the divorce proceedings, and he filed a declaration indicating that he could not find work. Since certain matters were not resolved in the first stipulation, the parties entered into a second agreement in October 2005. However, the ex-husband failed to inform the ex-wife that as of September 12, 2005, he had accepted a new job, earning $185,000 (before any earned commissions). This occurred before the divorce judgment was filed on October 18, 2005. The couple entered into their third stipulated judgment in December 2005, which purported to resolve “all matters” between them. In 2014, the ex-wife filed this proceeding to vacate the December judgment, arguing that the ex-husband had fraudulently misrepresented his employment status in December 2005 and pointing out that he had claimed to their daughter and her that he was unemployed and had no “real hope” of finding employment in the near future, due to his age. The trial court denied the motion, concluding that under Section 2122, the one-year statute of limitations had run, preventing the ex-wife from filing the action at this late date. She appealed. The court of appeals first pointed out that the ex-husband was obligated under Section 2102 to disclose his new employment during the time period prior to the formal termination of the marriage. Furthermore, Section 721 imposes a fiduciary duty on spouses. However, in this case, the marriage was not terminated until October 2005, after the ex-husband had secured employment. The court also ruled that the statute of limitations under Section 2122 had not run in this case, since there was insufficient evidence that the ex-wife “should have known” that the ex-husband had committed fraud. The court remanded the case back to the trial court so that it could address the merits of the ex-wife’s motion, which it had failed to do by denying the action based on statute of limitations grounds. This case clearly illustrates the imperative need to understand the local laws applicable to divorce cases. 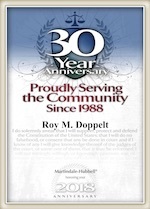 Roy M. Doppelt has been representing parties involved in divorce disputes for more than 20 years. Doppelt and Forney, APLC serves clients throughout Southern California, including in San Diego, Encinitas, La Jolla, and Chula Vista. For a free consultation, contact Doppelt and Forney, APLC through our website or give us a call toll-free at (800) ROY IS IT (769-4748).